No matter what you call this dish, it’s one of the best stick-to-your-ribs winter meals ever! I can recall Yeranuhe Nanny making herriseh with lamb - or a combination of lamb and chicken. This dish, a winter or holiday specialty, was always served with a bowl of freshly ground cumin for us to sprinkle on top. I have to admit, when I was young this recipe did not appeal to my culinary senses; it reminded me of creamy oatmeal with meat; it simply didn't make sense. As I got older, I must have gotten wiser, because I finally realized just how delicious - and nutritious - herriseh truly is. I guess Nanny knew best! Robert Witt, a reader from Texas, wrote recently, asking if there was a recipe for this dish. He said he'd eaten herriseh in a very nice restaurant in Yerevan. "It was made with chicken, and served with lavash, making the world seem all right - and a bit of Armenian cognac didn’t hurt the situation any, either!" What a great reaction, especially considering that this was part of his introduction to Armenian cuisine as well as Armenian culture. He went to Armenian to visit his son, his soon-to-be daughter-in-law, who is from Armenia's capital, and her family. Congratulations on your son's forth-coming wedding, Robert -- and welcome to the world of Armenian food! 1 whole chicken, approximately 3 lbs. 1. Rinse chicken. Place in large pot with 8 cups water and salt. Bring to a boil, then reduce heat to medium. Cook, with lid tilted, for about 45 minutes to 1 hour, or until chicken is cooked. 2. Remove chicken from liquid; place on platter until cool enough to handle. Discard skin, bones and fat. Shred chicken; cut into smaller pieces, if necessary. 4. Place broth in large pot. Add wheat, shredded chicken, and salt if necessary. Bring to a boil; reduce heat to low. Remove any foam which rises to the surface. 5. Simmer on a very low heat, covered, for about 4 hours -- without stirring! -- until almost all liquid is absorbed. 6. Beat vigorously with a sturdy, long-handled, wooden spoon, mashing the wheat and chicken until they resemble thick oatmeal. Adjust salt, if needed. 7. To serve: place in bowls. Add a pat of butter, if desired. Sprinkle with a dash of cumin or paprika. A.) Cooking the chicken a day in advance allows you to chill the broth and discard excess chicken fat. save you a lot of time and energy! C.) Leftover Herriseh freezes well. Just defrost, and reheat with a little extra liquid. Ah! Perhaps that's how keshkeg was first created! Although beating with a wooden spoon (or metal masher) is time consuming, I find that it gives a better flavor to the harrissah. Maybe it's all that elbow grease dripping in LOL. Another option is to put some of the harissah in a food processor, but again, it does not have the same flavor. Next time I make it, I am going to try making it in a dutch oven and cooking longer, to see if it naturally turns into porridge. Incidentally, in Adana, where my grandmother is from, they make the harissah with lamb and yarma, which I understand is like bulghur, but made from corn. I agree, Ara, the longer the cooking, the better the taste. Good-old, heavy-duty stirring does produce the best result, too. You are correct about yarma, also. It's split, boiled, then dried corn that's pounded with a mortar and pestle. Ah! Keshkeg! Love it (husband hates it, can't even smell it!) We've always made it with lamb. Didn't even know it could be made with turkey or chicken. I'm very curious as to the taste difference. Can't imagine. Now I'm craving it. I think I'll call up Mom and have her make it for me! If your mother makes you the chicken or turkey version of keshkeg, would you be kind enough to share your taste evaluation with the rest of the readers? My Mom made the chicken keshkeg! Here my evaluation. As I sit here eating the chicken version I'm thinking I wish this was made from lamb! Now, maybe that's because it's what I used to, however, I think it's more than that. Lamb has a stronger flavor. I know I'm eating keshkeg but I feel like I need to add more salt to really get the flavor to come out. I've already added some so I think that the chicken just doesn't have the intensity that the lamb does. Having said that, it's still good! A true treat that I am enjoying but next time Mom, make it with lamb! I hear you loud and clear. I, too, prefer it with lamb, but had chicken on hand the day we made it. Thanks for sharing your evaluation. Hi! I'm a filipino who's in LOVE with Chicken Herriseh! Thanks for posting this recipe! Is skinless whole wheat kernels same as bulgur wheat or barley? We have some Armenian groceries in the area but I don't know exactly what to ask for! 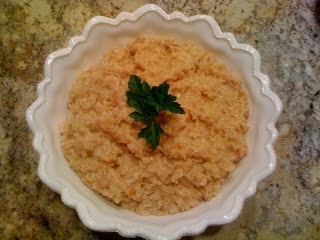 Bulgur: wheat kernels that have been steamed, dried and crushed. It's not the same as barley or skinless whole wheat kernels, and is not used for herriseh. Barley: a hardy grain; "hulled" barley has the outer husk removed & is the most nutritious form of barley. "Pearled" barley has the bran removed and is steamed and polished. Skinless whole wheat kernels: also known as dzedzadz, is hulled uncooked wheat. 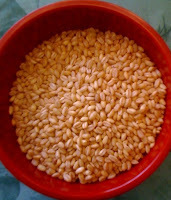 Either barley or skinless whole wheat kernels (dzedzadz) can be used to make herriseh. Here is a short cut I have been using the past few years. Rather than simmer on the stove for 4 hours (step 5 in the recipe), I put my ingredients in a crockpot set on low for 6 hours. Crockpot? What a brilliant idea! Thanks for sharing. I just made the keshkeg with chicken thighs that I roasted first, then put all the browned juices, fat, and bones in with the barley. (The recipe I received from an Armenian friend years ago said to use barley or the hulled wheat, and chicken or the lamb.) Roasting the chicken was a breakthrough: it gave much better flavor than boiling the chicken. I wonder if roasting would be good to do with the lamb, too, or if lamb doesn't need it because the flavor is already richer. Also, I used really high-quality, cultured butter that a friend had made from fresh, unpasteurized cream. Wow, does that taste good in there! I bet all the Armenian great-grandmas would approve! One last thing: I tried to simplify the recipe by just putting the meat in unshredded and uncut, just straight from the roasting pan. I added it when I started cooking the barley (which I soaked overnight first, because soaking grains overnight makes them easier to cook and easier to digest). Anyway, my point is that all I did was stir vigorously with a wooden spoon at the end, and the chicken shredded itself. This method was so much easier, I'm going to add keshkeg to my regular monthly menu. It's been years since I made it, because it was so time intensive. But this time, it was a cinch! Day 1, roast the meat and rinse and soak the barley or wheat. Day 2, combine the soaked grain (drained and rinsed again), meat, salt and spices and cook. Stir it hard, and voila, it's ready! I can't believe how easy it is this way. Thanks for posting this recipe and discussion online. Thanks Suzanne; another brilliant suggestion! Thanks for sharing. Our family loved this dish too, and always served it with browned butter. That nutty flavor really "makes it" for us. My grandmother had a huge terra cotta crock she put in the oven overnight, and then she (or one of the men) would beat it with a wooden bat! (By then, most of the smaller bones had melted.) We used stewing hens, so today I at least try to find a good quality chicken that actually has flavor. Turkey is a great idea (thank you! ), I will try it with a turkey thigh soon, in my crock pot. I'd love to know how your turkey leg keshkeg(made in the crock pot) turns out. I made it yesterday Robyn, with two turkey thighs and it was the best batch I've made in years! I started with a scant 2 cups of the wheat, soaked that overnight and proceeded. Turkey thighs have more flavor than the "indifferent" chickens often found in supermarkets. I got them at the local Amish Market (I'm in NJ), and also bought their lightly salted butter, as I usually only have unsalted at home, and prefer salted for this dish. Mmmm, the turkey thigh version sounds tasty! Thanks for sharing. Did you use the crock pot? If so, how long did it take to cook? BTW, where in NJ is there an Amish market? I go to the Amish Market in Kingston, but there are numerous others I gather, including at least in part at the old Trenton Farmer's Market. For Middle Eastern groceries, I have to head up to The Phoenician Market in New Brunswick, though. I've been lazy (sorry! ), posting as Anon, but am now finally taking the time to fill in my name, and a link to a blog I have. WOW, that sounds fabulous! It's a great way to use leftovers no-matter-what. I just made two huge lagans of keshkeg from leftover Thanksgiving turkey meat and bones. Yes, it requires more salt to bring out the flavor, and I much prefer it with lamb, but this is really quite good. For the grain, I used a combo of large bulghur, red lentils (vosp) and oatmeal. Texture and flavor are just like grandma's, esp w/ the addition of melted butter, cayenne and cumin. Ahhh....I also used the immersion blender. The texture isn't exactly the same as beating w/ a spoon (which gives you that nice stringiness), but it's still alot easier and the taste is the same. What an excellent use of leftover Thanksgiving turkey, and using a combination of grains is a great idea! An immersion blender? Why not! My mom has made this with leftover turkey since I was a kid. I don't speak Armenian so I had trouble figuring out how to spell it. My family always pronounced it like "Heddy-saw". I love it! Especially with smoked Turkey, makes a really unique flavor. I am currently trying to cook something from every country in the world, and this is what I used for Armenia. It turned out quite well! I can taste this keshkeg now. I grew up eating this delicious food, but when I married, my husband called it wallpaper paste. Although I grew up having this lamb, today, it is chicken. Can't wait to taste that buttery bit of goodness again. Yes, my husband will still call it wallpaper paste! We grew up with Amasyatsi lamb keshkeg that was roasted/baked in the oven all day. My father told the story that his mother would put all the ingredients together and his father would take the uncooked pot of ingredients to the baker who bake it in his oven all day and then his father would pick it up on the way back home after work. We would buy a whole leg of lamb and cut the meat off for shish kebab and then freeze what was left on the bone for winter keshkeg. We used the lamb bone, whole wheat, chick peas and water and stirred it and added water as needed throughout the day. And then my mother would add some saved chemen from basterma towards the end of the baking time if she had any. My mouth is watering just thinking about it. Any other Amasyatsi's out there know what I'm talking about?